All types of peas are full of nutrients. They provide eight vitamins, seven minerals, dietary fiber and protein. The three types of peas are garden peas, snow peas and snap peas. Garden peas have pods that are slightly curved in shape with a smooth texture and vibrant green color. 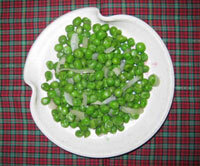 Inside are green rounded peas that taste sweet and starchy. Snow peas are flatter than garden peas. Snap peas have plump pods with a crisp texture. Peas are one of the few legumes sold and cooked as a fresh vegetable. Other legumes are dried (think black beans), roasted and covered in salt (peanuts, for example) or canned (like red kidney beans). When purchasing fresh garden peas, look for firm, smooth pods. Avoid buying yellow, whitish or speckled pods. Garden peas are available from spring through the beginning of the summer. For snow peas (which are eaten whole), buy the pods that have smaller peas because they are sweeter. Snow peas can be found all year long. When shopping for snap peas, snap one pod and see if it is crispy and bright green in color. Snap peas are usually only in stores from late spring through early summer. If peas are not used immediately, refrigerate them as soon as possible to preserve their sugar content. There is more than one way to eat a pea. Before eating fresh peas, rinse the pods well under water. Gently open garden pea pods to remove the seeds. Snow pea pods and snap pea pods can be eaten raw or cooked; cooking makes them sweeter. Add fresh peas to green salads or slaw. Mix garden peas with diced chicken, minced onions, light mayonnaise and almonds to make chicken salad. Sauté snap peas with mushrooms. Mix snow peas into your favorite stir-fry. This recipe can be served hot as a side dish or added cold to a salad. Heat olive oil in a non-stick skillet over medium heat. Stir in onion and garlic; cook about 5 minutes. Add frozen peas, and stir in stock. Season with salt and pepper if desired. Cover, and cook until the peas are tender, about 10 minutes. Posted in Featured, Recipes. Bookmark the permalink.